Just about everyone can recognize the fact that having the best bathroom exhaust fan is a good thing, since doing your business in a toilet without a fan on the bathroom can be rather unpleasant. It’s not just about improving the scent and the quality of the bathroom air. The fan also airs out the humidity that breeds mold and mildew, and the reduced humidity eventually leads to reduced bathroom maintenance costs. Also, with the best bathroom fan, the mirrors are less likely to fog up. The best locations to put your bathroom exhaust fan are near the areas that use lots of water. So it should be near the tub, shower, or toilet. Since the fan gets rid of toilet odors, you should have a small fan inside each separate toilet room or cubicle. Just turn on the fan when you come in and leave it on for about 20 to 30 minutes after you’ve used the shower or flushing toilet. We have spent hours of time preparing the following bathroom exhaust fan reviews. Let’s start with a widely acknowledged bestseller like the Panasonic FV-11VQ5 WhisperCeiling Fan. It’s very popular even though it’s one of the more expensive fans on this list.Part of the reason for this popularity is that the Panasonic brand is quite well-known. But the makers didn’t just rely on the good name of the brand. They’ve actually made a product that deserves such a famous brand, which is why the vast majority of customer reviews online for this model has given it perfect marks. Let’s start with its 110 CFM capacity. That makes it suitable for many bathrooms, since most homes usually have small bathrooms. If you have a “small” bathroom of 100 square meters or less, this will work. Then we come to the noise. Or more accurately, the utter lack of noise. It comes in at a Ninja-like 0.3 sones, and this makes it among the quietest of all bathroom exhaust fans. While there’s a few that can match the silence of its operation, none can actually beat it. So you won’t have to endure a racket inside while you’re in the bathroom doing your business. Finally, the quality of the design and the components are topnotch. It conforms to UL and cUL safety standards. It has the Energy Star label. It’s also been certified by the Home Ventilation Institute (HVI). Panasonic FV-11VQ5 WhisperCeiling has a permanently lubricated motor so it doesn’t wear down as quickly, and the motor also has thermal-cutoff fuses. It has a galvanized steel body, and the housing even comes with rustproof paint. The operating temperature is low, so the motor and the bearings can really last for a good long while. It’s easy to install for those with DIY experience. It even has a built-in damper, so the outside air doesn’t come in through the fan. All in all, it’s understandable why it’s the bestseller of the bunch. Air King BFQ 90 is one of the most affordable model, and with the 90 CFM rating it means that it’s good for bathrooms that measure just 90 square feet at the most.The model does have 100 and 120-CFM versions if your bathroom is a bit bigger. Air King BFQ 90 is also very easy to install, as it comes with a snap-in mounting system for your ceiling. Your purchase includes the needed wire nuts and connector. It also complies with various safety standards, and it can handle being run continuously. It also comes with a backdraft damper to protect against drafts. So why is it so affordable? Well, it comes in a plastic housing instead of galvanized steel. But at least it uses durable high-impact plastic. Also, the plastic is actually preferable if you live by the beach, as the steel is more likely to rust. Another reason for the low price is that it’s a bit on the noisy side, as it’s rated at 2.5 sones. But look on the bright side—the noise tells you the fan is working, and you can always play some music with your smartphone. This costs about 3 cups of coffee from a gourmet coffee shop.Broan 688 Ceiling and Wall Mount Fan is the cheapest of the bunch on this list, and for good reason. First of all, it only comes with a 50-CFM capacity, so it’s suitable for only the smallest bathrooms like one that measures 6 feet by 8 feet. It’s just no good for something bigger. Then there’s the racket it produces. It’s rated at 4 sones! So it’s like the TV is on when you’re in the bathroom. If you don’t realize how noisy this is, you’ll soon find out if your phone rings and you try to have a phone conversation with the exhaust fan on. Yet surprisingly, the majority of customer reviews for this item is mostly favorable. It’s not really just about the price. It’s the value it offers for your money. If you don’t mind the noise and you have a very small bathroom, the Broan 688 is proof that there’s no good reason not to have an exhaust fan in the bathroom. First of all, it’s made of plastic so those living by the beach may want to check it out. The compact size also means that you can fit it easily between the wall studs or the ceiling joists. All in all, you actually get a lot at this price point. Delta Breez SLM70 Slim is also among the more affordable ones, but it’s among the best. It offers a lot of outstanding features that you’ll appreciate at any price range.The main reason for the low price is that it offers 70 CFM, so again your bathroom should measure only 70 square feet at the most. The other reason why the price is low is that the noise level is rated at 2 sones. As we’ve mentioned, it’s like being in the middle of a moderate rainfall. But at least it can still qualify as “very good”. But it also comes with great features to offset the “drawbacks”. For one, it’s extremely energy-efficient. It’s not just Energy Star- certified. It exceeds the Energy Star efficiency standards by a mind-boggling 458%. To give you a practical idea of what this means, take note that the typical exhaust fan will add almost $$ to your annual energy bill when you use it continuously during the year. With this Delta Breez SLM70 Slim, the additional cost is only about a little over $ since it consumes only 13.1 watts. The $ is the additional cost for the entire year, should you use it 24/7. You can use this continuously, and that’s because the DC brushless motor it uses is much more long-lasting than its AC equivalent. So you know that it’s not expected to break down anytime soon after you buy it. You can mount this on the ceiling or the wall. And it even comes with an LED light so that you know that it’s working. Panasonic FV-08VQ5 Whisper Ceiling ,another Panasonic bathroom exhaust fan, and again the vast majority of customers give it full marks on their online reviews.You have to hand it to Panasonic—they know how to make great exhaust fans. The first thing you’ll notice (or more accurately, not notice) is the noise. Again, Panasonic has come up with a very quiet exhaust fan. It doesn’t exceed 0.3 sones. To put this in perspective, if you run 3 of these units together, the noise they will produce will still be quieter than the sound of rustling leaves. It’s so quiet that an admitted audiophile who gets annoyed at the slightest noises confessed that they can live with the sound this thing makes. Some, who feel reassured when they hear the noise of an exhaust fan (they’re sure that it’s working, you see), may even complain that it’s too quiet. They’re not quite sure if they turned it on or not. With its 80-CFM capacity, it means it’s good for small bathrooms that measure 80 square feet at the most. And it comes with all the features that mean it will last for a very long time, such as a lower operating temperature and a permanently lubricated motor. It also comes with a damper that keeps drafts out. And though you may want to check with customer service to be sure. Panasonic FV-30VQ3 WhisperCeiling is the most expensive best bathroom exhaust fan on this list, but it provides an excellent example of why going cheap may not be your best alternative. This is especially true if you have a large bathroom, or if your bathroom has several toilets, showers, and a hot tub. The capacity of this exhaust fan is outstanding, as it’s rated at 290 CFM. With this kind of power, you can decide to put it in the living room or kitchen to get rid of hot air, which can be terribly helpful especially in the summer. It’s ceiling-mounted, and as you should know, hot air rises. So it can siphon off the hot air and humidity, and if you have an air conditioner going then it won’t have to work as much to get the place colder. This is a huge exhaust fan measuring 19.4 x 15.6 x 12.5 inches. You’d think that at such a size and capacity it would have to make a lot of noise. But that’s not really the case here. While it’s not exactly silent, it still produces only 2 sones, and that’s like a moderate rain is going on. That’s about half as loud as other fans with the similar CFM capacity. In a 290-square foot room, that’s not really going to be too disruptive. If you’re planning to put this in a high-ceiling room (that’s not a bathroom), you first need to get the volume of the area in cubic feet. Get the square footage and then multiply by the height of the ceiling. Then divide the result by 7.5 and that’s how much CFM you need. So let’s say you have a room that measures 180 square feet and you have a 12-foot ceiling. That means the volume of the room is 2,160 cubic feet. Divide by 7.5 and the result is 288, which means that this 290-CFM exhaust fan is just right. This needs a 6-inch duct diameter, and at this size you’re probably better off with an experienced pro handling the installation. Still, you get the vaunted features that are prominent in Panasonic exhaust fans. You have the low operating temperature, the heavy-duty galvanized steel for the housing, and the corrosion-resistant paint. It has a damper to prevent air from coming in. It’s also Energy Star-certified, as it only uses 64 watts. The Delta Breez brand has long been renowned for their energy-efficiency, and with the Delta Breez GBR100 GreenBuilder they prove their excellence once again.While this offers a 100-CFM rating, it only uses up 12.6 watts. That means the energy efficiency is at an astounding 7.9 CFM per watt. Installation should be easy for those with DIY experience. It’s UL-certified for wall and ceiling installation, and it comes with the hanger bars included. It’s also very quiet at 1.4 sones, so it won’t disturb you in the bathroom at all. It may be so quiet that you won’t hear it when it’s working, but there’s an indicator light to tell you it’s on. It’s also designed to run continuously for 70,000 hours (that’s almost 8 years). The Air King’s main selling point is that it’s super affordable, but Air King AS54 Advantage has garnered a lot of extremely favorable reviews because it works so well given the price point. This model offers 50-CFM capability, so that’s good enough for any bathroom up to 50 square feet in area. You can use it for any room (except the bathroom) for up to 60 square feet in area. It’s also not all that noisy, as it only results in 3 sones. Many have also found it easy to install. While the Broan brand is almost synonymous with extremely affordable exhaust fans, it doesn’t mean that they can’t make mid-priced fans in high quality. This Broan 791LEDNT White 1.5 Sones model is a good example, as it has a 100 CFM capacity. That’s good for all bathrooms up to 100 square feet. Yet despite the strong air movement it offers, it’s not all that noisy. At 1.5 sones, it’s actually very quiet. It also comes with an LED light that’s bright enough at 800 lumens to function as a shower light. It provides soft white light that won’t really hurt your eyes. All you need is to install this properly with a 4-inch exhaust pipe, and you won’t have to endure too much humidity and other problems in your small bathroom. It’s even certified by the Home Ventilation Institute (HVI). What if you already have an exhaust fan and it’s no longer working as it should? You don’t really need to replace it if you don’t have to. With this upgrade kit from Broan, you can fix it easily without the accompanying installation hassles that usually go with exhaust fans. Your old fan will seem brand new in as little as 10 minutes. The Broan 690 Bathroom Fan Upgrade Kit comes with a new 60-CFM motor with a tolerable noise level of 3 sones. It also offers a new white grill for a better look. It also comes with 2 motor plates that fit most fans in this size, a wrench, fasteners and other components, and a clear set of instructions. If you already have a small exhaust fan in your small bathroom and you want to improve its faltering performance, then this is the kit you need. There’s a wide range of prices for bathroom exhaust fans, as it depends on its features and brand. Some go for as high as $165 or more, but a few others can be yours for just $15. There are probably other models that are much more expensive, but on our recommended list of fans we only go up to $165. Exhaust fans come with CFM info, and that’s cubic feet per minute of air movement. There are different rules for smaller and bigger bathrooms. Small bathrooms: If your bathroom measures less than 100 sq. ft., the basic rule is that you need 1 CFM per square feet. So if your bathroom measures 6 feet by 8 feet, you need at least 48 CFM. Larger bathrooms: Now if the square area is greater, the basic rule still applies but you need to add more CFM for certain elements. Each toilet and shower or tub enclosure needs an additional 50 CFM. If you have a jetted whirlpool tub, you have to add another 100 CFM to your exhaust fan capacity. This is measured in sones. If it is rated 2 sones, then it’s twice as loud as 1 sone, and if it’s 3 sones then it’s 3 times as loud, and so on. 0.5 sones: This is very quiet, as its equivalent is the sound of rustling leaves. 1 sone: This is the same as the sound of a quiet refrigerator or a subdued conversation. 2 sones: It’s like moderate rainfall. 3 sones: It’s the same as office noise, which for a fan can be a bit loud. 4 sones: This is the same as a normal conversation or the sound of the TV on. For a fan, this is already considered very noisy. Get one within 1.5 to 2 sones, and that’s considered as very good. A fan with a rating of 0.5 to 1.2 sones is regarded as exceptionally quiet. Some exhaust fans come with sensors that automatically turn on the unit at certain times. A motion sensor can activate the exhaust fan when you enter the bathroom. A humidity sensor activates the fan when it senses that the humidity in the bathroom has become too high. However, these accessories can significantly drive up the price. Some of the bathroom exhaust fans may have lights, which may also be activated by the motion sensor. Others have night lights that turn on when it’s too dark. There are even some units that come with built-in heaters such as infrared heat lamps, which can be useful when it’s a bit chilly outside. Of course, energy-efficiency can also be an important factor, and some of these units carry the Energy Star label. As you should have realized by now, there’s simply no good reason why you have to endure poor air quality, unpleasant smells, and foggy mirrors in the bathroom. Just make sure you get the right CFM rating for your bathroom size. These best bathroom fans don’t consume too much electricity, and some are extremely energy-efficient. They can be very quiet so they won’t disturb your peace. And they can last for quite a while. Just choose the best bathroom exhaust fan for your needs, preferences, and budget, and every visit to your bathroom will be much more pleasant from now on. 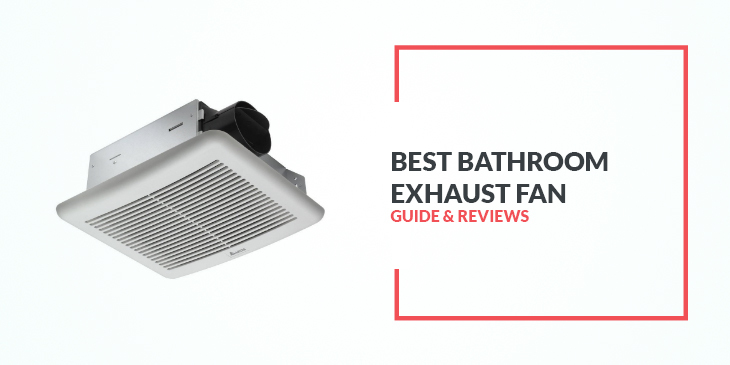 If you have any question about this bathroom exhaust fan reviews guide, feel free to let me leaving comment below.